Thai nam jim or Thai dipping sauce is crazy flavourful and dead easy. Garlic, shallots, lime juice and hot chilies. It’s a Thai wonder sauce. Thai dipping sauce is great on just about everything. Maybe not ice cream but other than that. It’s called nam jim. That’s actually just another way of saying Thai dipping sauce so that’s not particularly useful information. The flavours are wonderful though. Salty, sweet, spicy and sour. The core flavours of Southeast Asia. The only thing to plan for is a bit of time to let the flavours combine. It’s great when you mix it up but it’s even better if you give it a bit of time to come together. Not a ton of time. Not overnight. But an hour or two. Makes all the difference. Or better yet. Mix up a batch and keep it in the fridge. Use it when the mood hits. That makes it a condiment I guess. It’s a lot better than ketchup so I say it’s worth the space. And it gets better when it sits for a few days. This sauce works as a dressing as well. Add a bit of oil and drizzle it on a steak or chicken salad. On a budda bowl. With grilled meat or chicken. Like a Thai chimichurra. Tossed with chicken wings. Tossed with noodles. And that’s before you even dip anything in it. Like I said – great with just about everything. Good enough to eat with a spoon. You can just take everything, toss it into a food processor and pulse it. Don’t puree it though. You want little bits of everything in this sauce. That’s the easy way. Or, if you have a good knife and you like to use it, mince everything up. It’s good practice with your knife if nothing else. I don’t really know what else to say except I love this sauce. Try it on roast chicken some time. 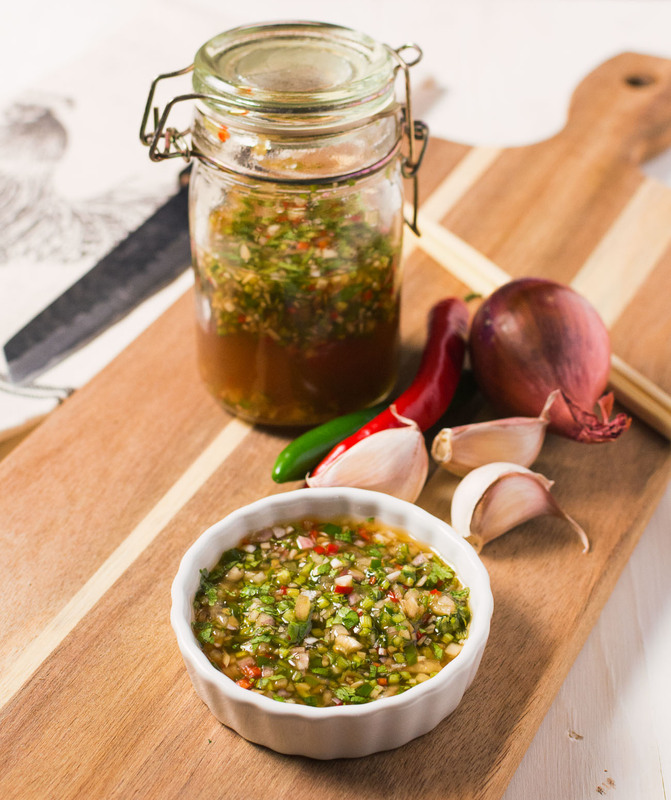 This Thai dipping sauce has all the core South Asian flavours rolled into one. 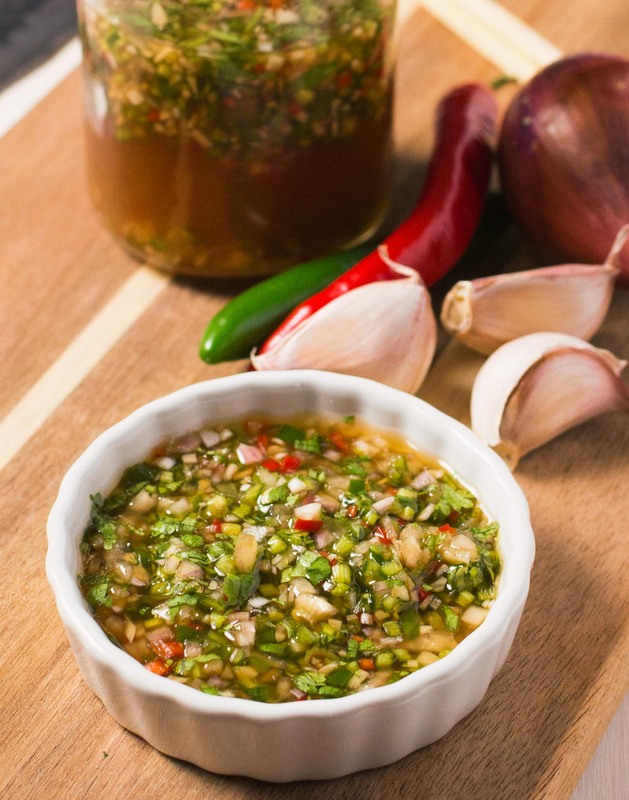 It works as a salad dressing or accompaniment to grilled meat and poultry. Let sit for an hour or more to let the flavours combine. In sides and stuff, thai. Bookmark the permalink. 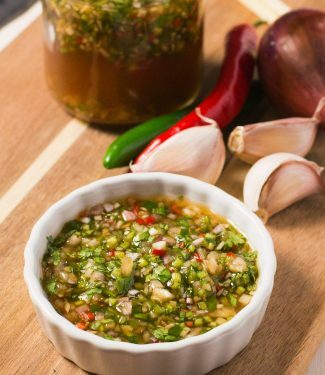 This Thai dipping sauce looks so versatile – I can’t wait to try all these uses. It looks like it would be perfect for dipping spring rolls or grilled chicken. Actually, I think I’ll just go ahead and use it as a marinade!! I have a feeling I’ll be making this really often. Marinade, drizzle, dip – it’s all good. Hope you like it. I’m a big fan of Thai flavors, so I’m loving this dipping sauce! 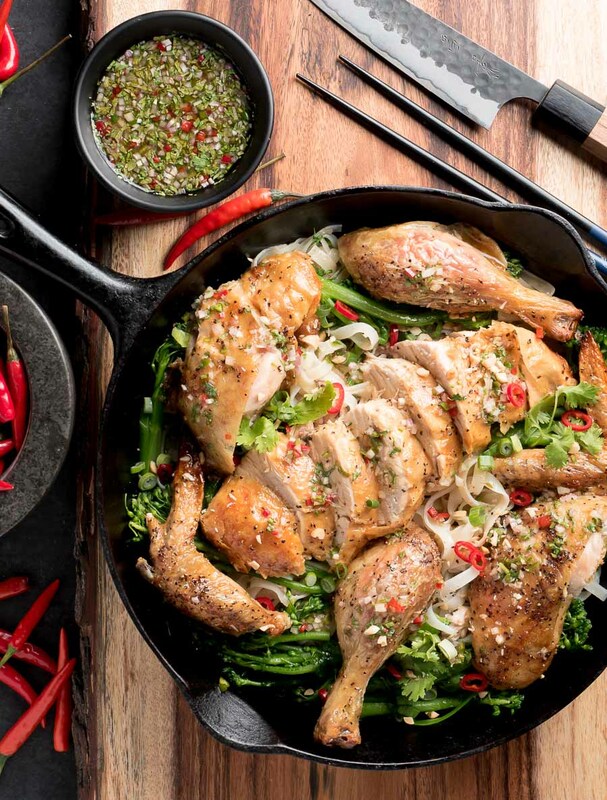 It’s a perfect way for me to add Thai flavors to absolutely everything! There’s this really simple dish I like to make on weekdays with grilled pork, rice noodles, and lettuce. I usually just use soy sauce to dip in, but now I have a new go to! Can’t wait to try it out! Thanks, Romain! I’m going to try your grilled pork, rice noodles and lettuce dish with this sauce. Sounds fantastic. I’ve got to try this sauce immediately! I’ve been accused of loving my condiments more than my actual food, so this is something that gets me excited to say the least. And the fact that I can throw everything in the food processor makes it even better! For some reason, I’m already thinking of pulled pork tacos with this Thai dipping sauce sounds pretty darn amazing, thanks for the recipe! Good one. I hadn’t thought of it with pulled pork. It’s just awesome drizzled over grilled chicken as well. I really like the versatility and flavours of this sauce! What is the best way to store the sauce and for how long can I keep it for? It keeps in the fridge for a few days. I store it in a glass mason jar. After a few days it starts to get a bit too strong tasting so best to use it up right way. OH YUM! This looks like such a flavourful sauce!! 😀 Now that the weather is warmer, I definitely will be making this to serve up with my grilled meats!! 😀 Excited! I can’t wait to get my grill going either. Grilled anything will work well with this sauce. When your saying red Chile and green what types did you use?